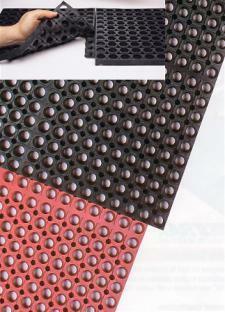 Anti-fatigue mats are a great comfort. Being in the same position for hours at a time can take a toll on the body. Whether you spend a lot of time at a desk, in your car or even on your feet all day, you can notice back, foot, shoulder and neck pain. However, there are adjustments you can make to be more comfortable, such as adding anti-fatigue mats to the floor for a little extra cushion that eases pressure on the joints. It’s a good idea to try and change up your routine as much as possible to ensure your body stays loose. According to the Chicago Sun-Times, taking standing breaks when you have a desk job can help combat back and neck pain. The news provider reports that the body is meant to move, and keeping it stationery at a desk for hours each day has seen an increase in people being treated for lower back and neck pain. In addition to taking standing breaks, there are other treatments you can do to combat pain. Healthline suggests regularly exercising and stretching, which can also help your body better adjust to the pressures of constant sitting and standing on the job if your muscles are looser and relaxed.